We provide a wide array of spray foam insulation systems with certified technicians for open cell, closed cell and hybrid spray foam insulation allowing for both short and long term savings. When your home is excessively hot in the summer or difficult to keep warm in the winter, we can provide immediate results with cost effective solutions. Provide an insulation to your commercial property that will not only provide a barrier to the elements from heat or cold but will continue providing a savings to your home over the years. "12 years ago I had the underside of my cabin spray foamed. I have been very satisfied and would do again without a moments hesitation and recommended it to a family member. The staff worked under not the best of winter conditions but got the job done!" J.T. Can you spot the house below that was spray foamed by Superior Insulation? With over a quarter century working in the building trades, I recognize total competence when I encounter it. I had the opportunity to work with the Williamstown crew, under VP James Hottum, on several occasions; I call it my "Spray-Foam Apprenticeship." Quite aside from being a most-reliable good friend of mine, "Jimmy" as I prefer to call him, has extensive knowledge of his trade (was dubbed "a genius" by the lead chemist of one of his material suppliers), full mastery over his equipment and work environment, and a complete willingness to take responsibility for the final outcome and long-term benefits of the customer. That's why my wife & I will have the Williamstown crew help us with our building in Michigan; it's worth it to us, to know that the work is being done right. It was in the late fall of 2010 that I contacted Williamstown after seeing them referenced very positively in an Internet ad published by a foam insulation manufacturer. One of Williamstown's employees installed framing on the long exposed wall that was a major source of cold temps in my office during the winters of 2008-2009 and 2009-2010. In addition to spraying the "bays" formed by the framing, they also sprayed unframed walls, worked around the tub and hot water heater, sprayed our power room, furnace room, and everywhere they could put the foam on our westerly wall that has some built-in shelves and storage cupboards. Their work was excellent, the product has made a terrific difference in the warmth level of the basement. The way they sprayed and sealed the sill area and right up to the sub-flooring above also helped noticeably in cutting down on a major ice problem we were experiencing on the roof and gutters on the back and front of our house. We have it in mind to have them come back and spray the areas above the cathedral ceilings we have in our dining and living rooms, which we think contribute greatly to the heat loss and remaining ice that builds up on the roof and gutters - L.S.. Photos taken 20-Feb-2015. Five different Cape Homes of similar design and style. All houses exposed to the same weather conditions; the same side of the street, same time of day, sun and wind exposure. All have 2nd floor living space. Only one home of the five has been insulated by Superior Insulation with 5-1/2” Open Cell Polyurethane Spray foam (has 2x6” rafters covered by 1/2” drywall). There were no ice dams or icicles on this cape. 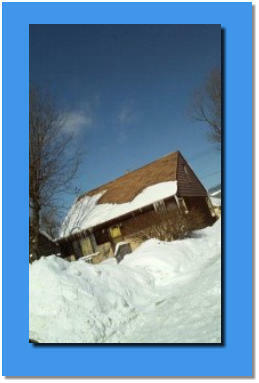 Ice dams/jams and icicles are created by heat loss or lack of insulation. The majority of these can be prevented as demonstrated. Conversely the same insulation significantly reduces heat infiltration in the summer months thus providing energy savings year round. FACT: Spray applied foam insulation is 95% effective in preventing heat infiltration in the summer and heat loss from your home in the winter. Foam Insulation systems can lower your heating and cooling bills by up to 35% on average. Can you spot the house that has been spray foamed by Superior Insulation?